Something New – God is Amazing! Pictures of God’s amazing Work! All I want is just to know His heart. Forget the former things; do not dwell on the past. See, I am doing a new thing! Now it springs up; do you not perceive it? 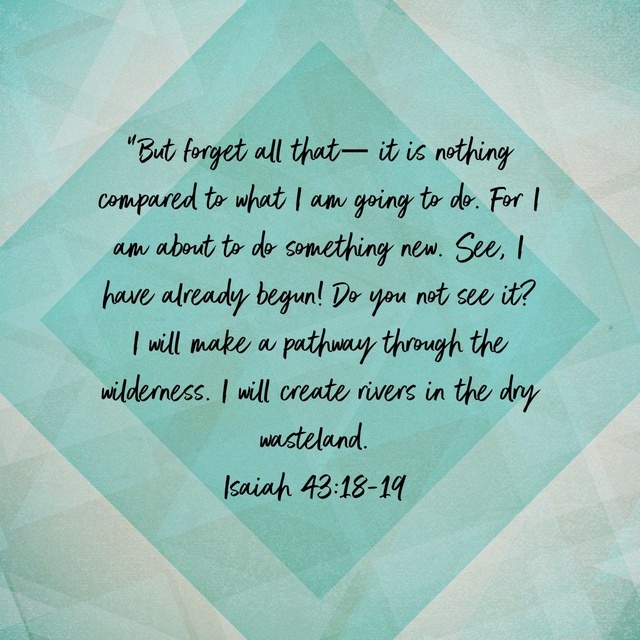 I am making a way in the desert and streams in the wasteland. A new thing. There’s something intriguing about that word. New. Clean, untouched, unspoiled, pure. When you say you got a new shirt it’s significant because you’ve never had it before. When your faith is renewed it’s exciting because all of the impurities, the weaknesses that were there before have been washed away. It’s a newfound passion for God. A new desire that is there because something has changed. It’s easy for faith to get stagnant. It is easy to lose sight of what our goal is, or for the newness to wear off and the passion to fade. Our minds have this human tendency to focus on what is exciting to us, so when our faith has lost its newness it’s no longer exciting and our minds tend to wander. We still believe the things we used to, but there is no new growth, nothing to focus on, no action steps to take that we haven’t taken before. That’s when we begin to feel stuck, we start to feel like we are going nowhere. Questions such as “I’m reading my bible so why am I not learning?” or “I pray every day, so why is nothing changing?” start to surface. It’s difficult. When you don’t know what the next step to take in your faith is, and you are aware you need to grow, but you don’t know where to start, that’s difficult. The first thing I suggest is to pray. Pray as you’ve never prayed before. For me, I never have been able to focus if I just get down on my knees and talk, I’m working on it. I write my prayers. This morning I knew that something needed to change, I had been stuck for way too long. The weeks were flying by and I wasn’t growing, the days blended together as a monotonous blend of school and work, eat and sleep. My passion was gone. I was happy but in an ordinary way. Something needed to be done, the problem needed to be fixed. I got up early this morning, I sat down with my journal and my bible, put on some worship music, and I just wrote. I wrote until my hand hurt. I poured out my heart to God. Yeah, he knew what was happening, but I needed to talk to Him about it. Desperately. Deeply. The shallow 30-second prayers I’d been rushing through before I fell asleep were not cutting it. It was time to really talk. Time to listen. A relationship is nothing without communication and there had been a sad lack of communication between God and me. So that’s the first step. Pray. And listen. Fill up on God’s word! It’s such a precious resource that we truly can never get enough of! If you want to know the heart of God then you need to get into His word! The second thing is to change up your routine. You cannot do the same thing and expect new results, that is actually not far off from the definition of insanity. Do you already pray every day? Great, change up the way you pray. Journal, talk to Him outside away from everything else, go on a walk and talk to Him do something NEW. Have you read the Bible a dozen times? There is still new information or new perspective with which to look at things you already know, get a reading plan, read in a different place. Even switch up the version of your Bible. Ask God to show you what He wants you to see. I promise you that He will! Pray about everything! That is my challenge today. For one day I am going to try very hard to pray about everything I think about. It’s hard, but prayer should be as natural as a conversation because really that’s all it is. So change up the way you’re doing things, change up the way that you are looking at things. God does something new every single day, you just have to be paying attention enough to catch it. His mercies are new every single day. He blesses us in new ways every single day. He is so good and so worthy of praise y’all! So all of this, changing up everything, is to help you renew your passion for God. Renew your faith, keep it fresh, for lack of a better word. I’m not saying that our core beliefs change, because our foundations and beliefs should be the same as those of the original disciples. We are not discarding our old beliefs, but adding to the ways in which we know how to practice them. We’ve got to learn and grow and advance, just as we do with any practice or system that is applicable to life. Thank You so much for this incredible life You have given us. It is full of blessings on top of blessings. Thank You for Your Word, which is never irrelevent, never out of date. God please keep us always learning, always growing and never stagnent in our faith. Teach us your ways and please help us to discern your ways from the ways of people, even sometimes of people leading in Your name. Help us to know your word, know what is true all of the time. You are good. Aubrey Carr on Inner Beauty Part 1: Judging it. Elise on Inner Beauty Part 1: Judging it.